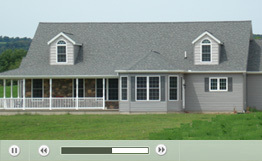 F&N Homes is a modular home builder located in Bloomsburg, Pennsylvania. For the past twenty-two years, F&N Homes has been building top quality affordable modular homes throughout central Pennsylvania. There is increasing recognition by home buyers that modular building provides superior construction and design flexibility with significant savings of both cost and construction time. The difference between a modular home and a traditional, or stick built, home is the method of construction. A modular home is built from component parts, or modules, which are manufactured in a factory. Upon completion, the modules are loaded onto trucks and transported to a prepared building site where they are assembled together and placed onto a foundation. The home is then finished to the customer’s exact specification. The appearance and functionality of a modular home is exactly the same as a stick built home. F&N Homes is a custom modular builder. We can build a modular home in any style, ranging from a multi-story traditional to a single story contemporary. Modular construction offers the same design flexibility as stick-built construction. F&N Homes will work with you, from start to finish, tohelp you design the right house at the right price. A modular home is superior to stick built construction in quality and structural integrity. A prefabricated modular building is built to be durable. The modular components are constructed to withstand the rigors of transportation and lifting by crane. Modular construction is actually overbuilt, using approximately 30% more materials than stick built construction. Each component is precision manufactured to exact specifications, resulting in components that fit together perfectly. According to industry sources, a modular home can be built in about half the time that it takes to construct a stick built home. There are no weather delays, as approximately 90% of a modular home is built indoors, under highly controlled manufacturing conditions. Excavation and foundation work can be completed simultaneously with the manufacturing of the components, so that valuable time is not wasted. Modular construction is cost-effective. Modular construction provides significant cost savings, an estimated 15-30%, over stick built construction. This means you get more for your money with modular construction. The assembly line process used in modular manufacturing utilizes a skilled labor force with a lower wage cost than that of the conventional building trades. Precision manufacturing means less material waste. With high volume factory construction, home manufacturers purchase materials and supplies in bulk at reduced rates, passing these cost savings on to the home buyer. F&N will help you build the home that is right for you. We have a wide variety of standard floor plans from several top quality home manufacturers that we can build “as is” or modify to meet your specifications. F&N Homes works with manufacturers that we know and who have earned our trust, as well as our business. Working with more than one manufacturer maximizes the number of design choices for our customers and allows our customers to compare prices as well as style. Most of our customers choose to build a custom designed home. With modular building, custom design is easy and affordable. Bring us your own set of plans or just an idea. F&N Homes will work with you to build the home the home you want. Custom design is not limited to floor plans and layout. F&N will custom design and build all of the interior and exterior features and amenities that you desire: from fireplaces and vaulted ceilings, to granite countertops and recessed lighting.. The possibilities are unlimited. We also customize the exterior features of a home, including skylights, porches and exterior finish. If you are thinking about building a home, consider the advantages of modular construction. Send F&N Homes a message or call us at 570-753-2440 to set up an appointment. Learn more about how you can turn your dream home into reality with quality, on time and cost-effective modular construction.